Owing your own business opens up the possibility to make money more than you can make as an employee. If you are looking for such opportunity to have your own business in Pondicherry then, Chaat Ka Chaska street food and chaat franchise business in Pondicherry is the best option for you. One of the best business that requires very low investment is food business and street food business ensures highest ROI. So, for all those who are looking to start their own business in Pondicherry with low investment and make money with sufficient margins. Grab the opportunity to be a member of India’s leading brand and open your own Chaat Ka Chaska street food franchise in Pondicherry. Why Chaat Ka Chaska Franchise in Pondicherry? Away from the hustle and bustle of big cities, Puducherry is a quiet little town on the southern coast of India. Pondicherry is the capital city and the largest city of the Indian union territory of Puducherry. It is one of the best tourist destinations in India with French colonial settlement in India until 1954. The city has so many attractions like Pondicherry beach, Raj Niwas, Promenade, Pondicherry Museum, Park Memorial, French War Memorial, Manakula Vinayagar Temple, Bharati Government Park, Chunnambar Boathouse, Pondicherry Botanical Garden and much more. With so many unique and exciting list of places to see in Pondicherry the tourists get confused which places to cover within a short period of time. But the one place that they can never forget or miss to visit is the trendy restaurants or food cafe. The tourists while doing shopping would like to sit and relax in a place where they can eat also. The tourists will come from different parts of India and they will surely miss their state food. The Indian street foods are something that everyone’s enjoy. Serving Indian street foods to the customers will attract more and more customers hence, street food franchise business in Pondicherry will be a profitable venture for you. There are many favorable places where you can open your restaurant or street food cafe. The city has huge potential for growth in food business. There are many institutes, colleges, shopping malls, complexes and super markets that are perfect for establishing street food business. 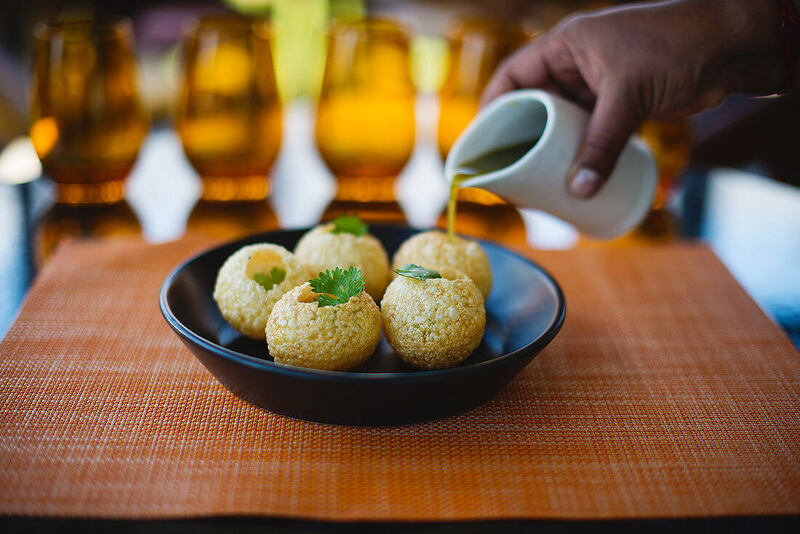 The students and tourists will be your potential customers and also the local residents would love to taste the mouthwatering water balls (Panipuri), Chaat, Tikki, Tikki Chaat, Sevpuri, Bhelpuri and many other enticing street foods. So, opening a Chaat Ka Chaska street food business in these area will be the best idea and wise decision for the people who are looking for establishing their own business with low investment. Open your own food business in Pondicherry with Chaat Ka Chaska that is offering you excellent street food franchise opportunity in Pondicherry. Along with solid business plan we provide remarkable franchise support, real time guidance and excellent customer service. Don’t miss the opportunity to have your own business and be your own boss by opening a food business in Pondicherry and be a member of India’s leading brand in the food industry.